The emergence of the Internet as an economic force turned corporations and small businesses on their head. Before the Internet, most jobs were in factories, offices, etc. – generally not in the home. But then, everything changed. A growing number of people found themselves able (and preferring) to work from home. This led to another dilemma: where would they work from? Most serious workers found their productivity considerably reduced when they worked from their beds, so they carved out private, inviolable sanctums where they could work peacefully. This was the catalyst for the rise of the home office. Today, I’ll try to help you pick out a home office design that’s perfect for you. But before I start, I need to talk about how important your comfort is. Your comfort is directly proportional to your productivity, so try to mould the elements of your home to your own (very specific) needs and desires. Don’t skimp on this, because your home office is going to be the place where you’ll spend a great deal of your time. For example, get a good ergonomic chair – one that will give you both lumbar support and help you achieve proper sitting posture – and you’ll see your productivity skyrocket. Now I’ve wrapped that up, let’s move on to the design ideas. As I mentioned earlier, you’ll be spending a huge chunk of your life in your home office.Don’t try to be stingy by stuffing yourself into a tiny closet to keep the guest bedroom open. Also consider external traffic and distractions. If noise drives you up the wall, you should probably tuck your office into a quiet corner of the house. Next, think about your clientele. If most of your client communication will be in person, then you’ll have to make appropriate seating arrangements. 'Form follows function’ is not only an important principle of modernist architecture but also a great guideline on how to design your home office. Every item in your office should serve you. Anything superfluous simply shouldn’t be there. That doesn’t mean that you should entirely ignore aesthetics but that aesthetics shouldn’t be the first priority. Try and get equipment that looks great and is actually useful. Of course, if you’ll be having a lot of physical interaction with clients in your office, you should design to impress. A blank wall isn’t interesting in any sense of the word, so don’t position your desk where you’ll spend hours staring at one. If possible, try to situate your desk in front of a window. If you can’t, hang a picture where you can see it, or place your chair facing the door. 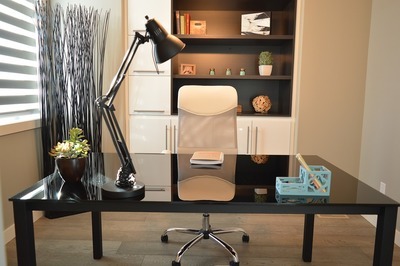 Pick one specific theme when choosing your home office design. A lot of designers prefer a homey theme that enhances comfort because most people associate their homes with comfort and cosiness. However, you can pick your own theme. Try to stick to it as much as possible to avoid glaring irregularities in your home office decor. Most home offices aren’t exactly overflowing with space, so learn to utilise existing space efficiently. Try organise vertically to get access to a huge amount of commonly overlooked space. 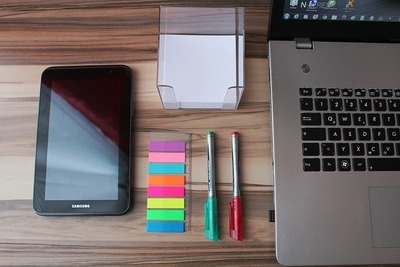 Use floating shelves to avoid piles of paper on your desk, and get some vertical file folders to keep important papers close at hand. You probably won’t be able to beautify your computer and printer much, but you can (and should) conceal those unattractive cords. Keep your equipment close to outlets to avoid long and winding cords that will both look bad and create tripping hazards. Get cord covers to for those cords that have to be on the desk, and tuck the rest out of the way by using some cable organisers. Low light in your office is a foolproof way to give yourself headaches and eye strain. Throw those curtains wide open, position your monitor to avoid glare and get a small lamp to light up your desk. This office is going to be the place where you try to make a living. You’ll try and fail dozens of times here. Put up a shrine in your office. Maybe a few motivational quotes or a picture of your kids. Maybe even a picture of that car you’re saving up for. This shrine will remind you what you’re working towards, and it’ll help you keep your chin up even in the most difficult of circumstances.